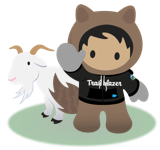 When using a Community template and the logout url is set within the settings the user is taken to the correct logout URL if logging out, but if the session ends the user is logged out where they are direct to wwww.salesforce.com. The expectation is that either log out or session timeout the user should be directed to the custom URL set in the "Logout Page" in the community settings. 1. Create a community user and set the timeout value as 15 in the user profile. 2. Login to community and wait for timeout. 3. Page gets redirected to login page. 3. It should get redirected to login page.